is the most fabulous of all? If you really want to know the answer to this question, of course, you’ll have to discover it for yourself. And there’s no better way to do that than by backpacking Washington’s iconic Wonderland Trail. This 93-mile loop circumnavigates the entire mountain, giving you a non-stop parade of jaw-dropping alpine scenery, all with the mighty 14,410 foot glaciated peak of Mount Rainier as the backdrop. What more could you ask for? As avid travelers, people often ask us what our favorite destination is. Every trip we take is dear to us, and, while we usually say that it is too hard to choose, there are some places that hold a special place in our hearts. The Wonderland Trail is definitely one of them. Wonder why? Take a look at this cool video, and we think you’ll understand. OK, backpacking 93 miles while gaining and losing 25,000+ feet of elevation might seem a bit overwhelming, but the Wonderland Trail is surprisingly doable. This fun, physical challenge has it all: striking scenery, gargantuan glaciers, rollicking river crossings, thrilling wildlife encounters, spine-tingling suspension bridges, stunning waterfalls, slippery snowfields, serene campsites and wildflowers galore. Complete the entire journey, and doubtless you will be overwhelmed by everything you have seen. Best of all, the Wonderland Trail is perfectly designed for you to experience and enjoy it all. Here is a quick guide for how you, too, can hike the Wonderland Trail. The Wonderland Trail has several access points where you can get on and off the trail. Because it is a loop, this makes the logistics of doing the trail a lot easier. Simply park your car at a trailhead and hike back to it 93 miles later. Piece of cake! We chose to start at the White River Campground on Rainier’s northeast side primarily because it provided us a convenient place to sleep the night before starting the trek and offered us a relatively safe place to leave our rental car while we were on the trail. 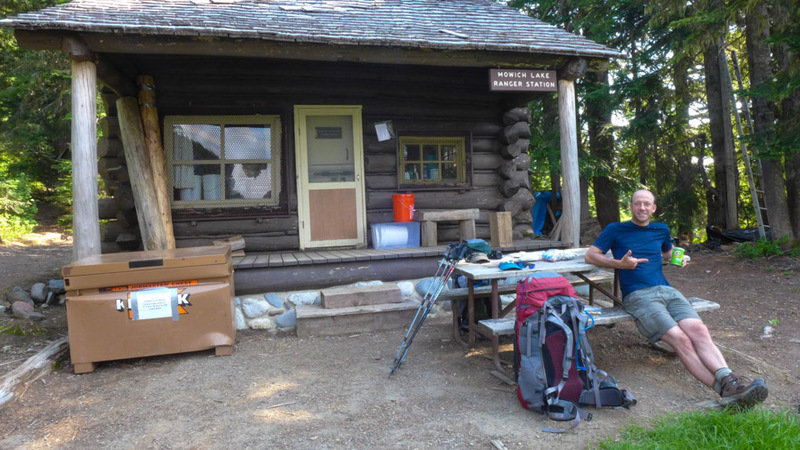 Additionally, it was equidistant from both the Longmire and Mowich Lake food caches (more on that later), making the logistics of packing food and fuel easier. As an added bonus, starting at White River allowed us to both begin and end the experience with gorgeous sections of trail. They say that hiking the Wonderland Trail is like walking on the edge of a giant pie crust. You are constantly going up and down over the ridges of the heavily-glaciated mountain, gaining and losing over 25,000 feet in the process. You need to decide which direction you want to do that in. Generally speaking, if you prefer downhills, you should hike clockwise; if uphills are more your style, go counter-clockwise. Have no fear. You will encounter plenty of both no matter which direction you choose. Check out the trail profile below, and you’ll see what we mean. We decided to hike the trail in a counter-clockwise direction. As 40+ year old hikers (sigh…), we generally find it kinder to our knees to tackle long uphills rather than steep downhills, especially when carrying full backpacks. With White River as our starting point, traveling counter-clockwise also gave us a few easier days at the beginning of the trek to get our backpacking legs beneath us. It also saved the difficult trip over snow-covered Panhandle Gap until the very end of our journey when we were in our best backpacking shape and most confident. The majority of people hike clockwise, so doing the opposite had some additional benefits. For the most part, it felt like we had the park to ourselves. Most of the people we encountered on the trail were going in the other direction, so encounters were pleasant and brief but often included valuable exchanges of information. As first-timers on the trail, we enjoyed the news we heard on the “trail telegraph” about what we would be encountering in the miles ahead. On a couple of occasions we crossed paths with people we had met days earlier on the trail. It was fun to reconnect and share experiences with these hiking acquaintances. As mentioned before, the Wonderland Trail is a serious undertaking, so know your physical abilities when deciding how much mileage you can reasonably cover backpacking each day. The Park Service recommends allowing 10-14 days to complete the entire trail, and there are backcountry camps scattered along the trail allowing for a variety of mileage options. We hiked the trail in 12 days, averaging 8 miles/day, but most people we met were circuiting in far fewer. The most typical length was 8 days, but we met a couple completing the hike in 5 and two ultra-marathoners who ran it in 3 days! We can’t imagine what these speed demons remember seeing along the way. The couple circuiting in 5 days told us that they were so exhausted each day that everything was more or less a blur. Seriously, what’s the point? Take as much time as possible to fully appreciate this amazing experience. The WT is incredibly beautiful, and you are out there to enjoy not just the achievement, but the journey. Take a look at the pictures below. Hiking any faster for us would have meant sacrificing all of these relaxing and memorable moments. Whatever it is you think you’ll be missing back home will be waiting there for you when you get back. And, as soon as you are finished, you’ll wish you could do it all over again. So why rush it? Okay, we apologize that we aren’t giving you a lot of warning here, but you’ve got to get on this right away. A backcountry permit is necessary to stay in the camps along the Wonderland Trail. Download a copy of the park’s Wilderness Trip Planner to help plan your route. Then simply fill out the online Permit Reservation Request and indicate which camps you want to stay at each night along the trail. Submit your application to the Park Service any time between March 15-31 to participate in the advance online permit lottery. NB: This is now the only way that you can apply for an advance permit to do the Wonderland Trail. The park no longer accepts reservation requests by mail, fax, phone or any other wacky method you may come up with to draw attention to your request. This is a brand new system for the park after a massive power outage shut down their old fax system in 2016. This led to a lot of chaos last summer with no advance permits being given out and a massive numbers of hikers (including us!) showing up at the park’s doorstep hoping to get their hands on a walk-up permit. It wasn’t all bad, though. The snafu encouraged the park service to develop a better system for handling the large volume of permit requests that they receive every year, and 2017 will be the first year to try out the new system. Only one application is allowed per Wonderland hiking party, so be sure to play fair or your application could be thrown out completely. If you miss the March 31 deadline, you can still apply for a permit online. Any requests received starting April 1 are processed in the order received. You can also make a request in person once the Longmire Wilderness Information Center opens in late May, but most camps will likely already be reserved by then. The advance permit lottery is definitely the way to go. You’ve got the next two weeks to get your act together. Do it! Starting April 1, park staff begin pulling reservation requests in a lottery process and try to issue as many permits as possible. If you are lucky, you will get an email within a few weeks stating that your permit request has been filled and that you can pick it up in the park at a Wilderness Information Center before 10:00 am on the first day of your trip. We weren’t so lucky and got a denial letter instead. Fortunately for procrastinators or unlucky people like us, the Park Service sets aside 30% of the backcountry sites for first-come, first-served permits. These become available one day prior to starting. Since most backcountry camps only have 3-8 campsites in total, this means that only 1 or 2 sites at each camp are held open for people applying in person. That doesn’t seem like very good odds, but we are here to tell you that the walk-up process can work out. We had our hearts set on trekking the Wonderland Trail and ultimately didn’t care where we started or which direction we went as long as we could have a minimum of 10-11 days to complete it. We decided we would take our chances, fly to Washington state, be as flexible as possible and ultimately happy to spend two weeks hiking or backpacking elsewhere if we didn’t get the permit. We visited the Wilderness Information Center (WIC) at Longmire on the park’s southwest side to apply for our permit in person. We timed our arrival for early morning and crossed our fingers as we walked in. We had our original permit applications with us and showed our ideal itinerary to the helpful ranger. Within a few minutes, Lana secured all but two of our requested camps. We were able to choose alternate camps for those locations, and the process was done. We couldn’t believe our good fortune! We heard later on the trail that two factors greatly increased our chances that fateful day. 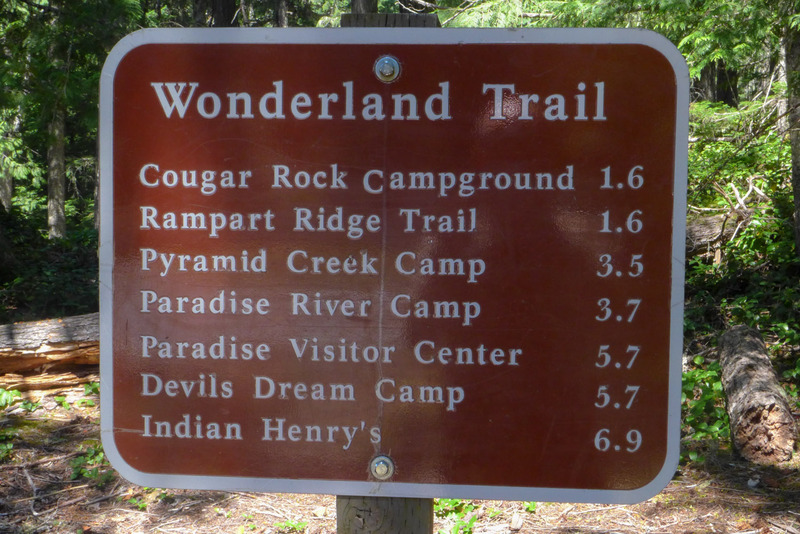 The first was that we arrived on a Monday and technically started our Wonderland experience that day by staying overnight in the backcountry camp at White River Campground. (In reality, we just drove ourselves to the campground and spent the night there before hiking the next day.) Avoiding the weekend and starting on the slowest day of the week gave us a huge advantage. Another factor that helped us was the length of our itinerary. We scored permits for many of the premier camps along the trail because nobody else had access to those walk-up permits 10 and 11 days from our starting date. This was an incredible advantage, especially given that we were hiking in late July and early August, the Wonderland Trail’s peak season. There are four cache stations along the trail, meaning that no matter how long you decide to hike you can get away with carrying only one-third of the food/fuel you will need at a time. On a 93-mile hike, this is an amazing convenience. During our twelve days, we never had to carry more than a 4-day supply of food at a time, saving us enormous amounts of weight and space in our packs and ultimately making it possible to hike the trail. Cacheing is easy. You simply pack your food and whatever else you would like to cache (clean socks, wet wipes, etc.) into a hard-sided container (5-gallon Home Depot buckets work great) and label it clearly with your name, permit number, and the date you expect to pick it up. You can leave fuel to pick up, too. It is possible to drive your food and fuel to each of the cache locations, but you will need to allow a full day to do this, as the roads are not direct and the distances between each location significant. You can also mail your food (but not fuel) ahead of time to the cache locations, and the rangers will put it out for you on the date you have designated. We did a combination of both. Because Mowich Lake is the most difficult cache location to reach, we decided to mail one of our caches there. Hoping to start hiking at White River, we entered the park at the Nisqually Entrance in the southwest corner and headed right to Longmire, where we applied for our permit. Permit secured, we left another 4-day cache of food and fuel there and then drove to our starting point at White River with our first 4-day supply of food and an 8-day supply of fuel. The Wonderland Trail is seriously stunning. Take the best camera you have (or feel like you can carry for 93 miles) and be sure to use it. We’ll be the first to tell you that backpacking and photography aren’t the best of bedfellows. Trust us, when you are carrying everything on your back, the extra weight of a camera seems like an excessive burden. Dropping your pack to unearth it for a photograph is a monumental task. But you’ll want those photos to prove to people back home why you did something so extraordinary. Was hauling a 40+ pound backpack for 93 miles around an entire mountain worth it? Is sleeping in a tent and not showering for 12 days your idea of fun? Did you really run into a mother bear and two cubs right outside of your campsite? 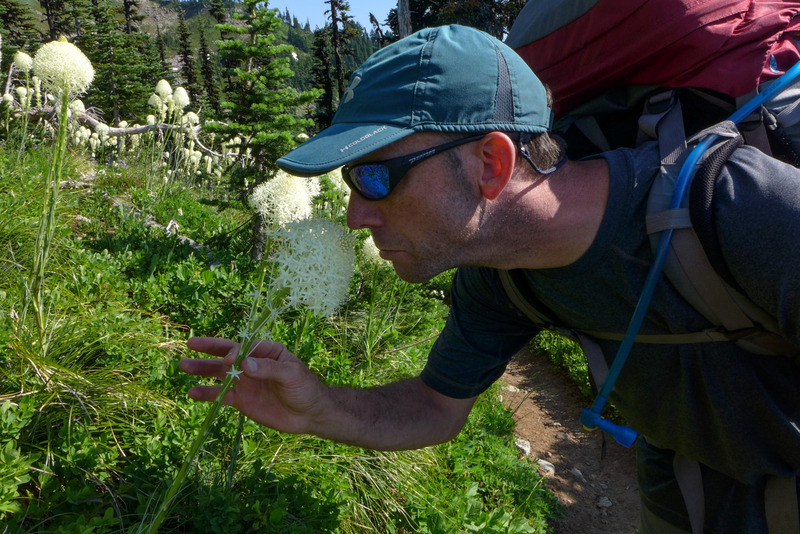 As the old saying goes, a picture is worth a thousand words, and we’ve also found that stopping to smell the bear grass (and photographing it while you’re at it) can be the perfect remedy to a long day on the trail. We packed our DSLR and a small travel tripod for the money shots. Whenever we got to a fabulous destination, we dropped the packs and made sure to time our snack breaks and meals with these photo shoots. We also carried a small Lumix LX7 point-and-shoot for documenting moments and scenes while we were on the move and didn’t feel we could spare the time or energy needed to unpack the big camera. We used 2 full batteries for our DSLR camera and all 4 batteries we were carrying for our Lumix point-and-shoot. Consider packing a battery charger in your cache at Longmire or Sunrise so you can recharge batteries from an electrical outlet while you are having a meal at the restaurants. Camps are mostly located in wooded areas making solar chargers a risky option. So grab your camera, pack your backpack and lace up those boots. A world of wonders awaits you on the Wonderland Trail! Be sure to pick up a copy of our new book Plan & Go: Wonderland Trail to help plan your trip. It has has tons of incredibly useful information covering every aspect of organizing the trip, fantastic trail descriptions, and many itinerary options depending on how long you want to be out on the trail. We are confident it will be an invaluable resource to you for planning and being on the trail. It’s available on Amazon, too! A day-by-day version of our adventure on the Wonderland Trail appeared in the third issue of Sidewalk – a hiking and backpacking magazine. Check it out! Oh boy, did this bring back memories! Just awesome photography and videos. I loved it. And just think, all the fabulous hiking we did at Mount Rainier was in addition to the Wonderland Trail. It truly is a spectacular park. I think it is one of my favorites! Wow, absolutely stunning! Gorgeous pictures.. What kind of camera do you use? Thank you! We carried a Canon 7D and a Lumix LX7, so you are seeing a combination of both here. A single lens for the 7D? We had a short zoom that we used for 99% of our photos. We did also carry a 70-300 mm that we almost never used. However, it was awesome to have when the bears came into our camp. We also had to use it on the very last day when our primary lens stopped working and when we ran out of battery power on our Lumix. Great post and amazing pics! What’s in store for you this coming summer? Hi Lynne! Thank you so much. This summer we are headed to the Cordillera Blanca in Peru. We just can’t get enough of the hiking. Where are you off to? Very cool! I am sure that Leif and Cara will make awesome backpackers not too far in the future. We look forward to canoeing with you all in the Boundary Waters soon! Thanks for reading, Sheri. We are glad that you enjoyed it! Fantastic photos! I will visit here one day! Thanks, James. You won’t regret it! Wow, wow, wow! This is going on the bucket list!! Hiking 93 miles sounds like a lot, but those little conveniences–like the cache stations–make it sound very doable, and the photos make it look absolutely worthwhile! Thanks for sharing so many gorgeous images. Flipping through them on this snowy NYC day reminded me that spring and summer are right around the corner! Thank you for stopping by, Melissa. You and Shon should definitely do the Wonderland; you two would love it! I wish all big hikes were as logistically easy as this one. We have lots more on our list, but I think they will be a lot tougher to plan. Do you have any spring/summer travel plans with Baby Ben? Haven’t heard of this trail here in Australia, but it looks amazing! Another trail to add to the list! Cool! We have our eyes on a few interesting ones in Australia like the Overland Track, the Larapinto Trail and Fraser Island. Do you have any favorites that you recommend? I havent done these but ive heard good thungs about them all! The overland is top of my list to do! Larapinta looks amazing as well, if you like that typical aussie “red earth” scene. Here on the west coast we have the bibbulmun track – takes about 6 weeks to complete, and the cape to cape track, a 5 day trail in the southwest corner. Thanks for the info. We’ll have to check those out. We haven’t made it to Australia yet, but we definitely plan on going one day. Those are some stunning photos! I have officially put this on my list of things to do in the future. It looks like you lucked out with some nice weather. Thanks for the informative and thorough post! Thanks for stopping by, Jeff! We were very lucky with the weather. We only had five minutes of rain for the entire 12 days we were on the trail. It doesn’t get much better than that! Thank you, Hassan. The Wonderland is an amazing trek! Amazing views all the way around and even a bear cub photo! It looks like you maximized your time all the way around. What a place! What an awesome trip! It reminds me of my camping days in Colorado. You guys sure saw some beautiful stuff. Sounds like a truly great adventure you had! You are absolutely right, Andy! Washington and Colorado must be two of our most beautiful states. We’d love to spend more time in both of them! Thank you so much for posting this. I am planning to do the trail counter-clockwise this summer and it’s hard to find a good writeup of that direction. Your photos are amazing and inspirational, too! Can you tell me…was all/most of the trail decent footbed? I did part of the PCT last summer and there was a lot of loose rock that was not kind to my knees. You are most welcome, Sandra. We are happy that our post was helpful to you. We found the footing on the trail to be very secure–yet another fantastic aspect of the Wonderland Trail! Since you are hiking counter-clockwise, be sure to stay tuned for more detailed descriptions of what we encountered each day on the trail. They’ll be coming soon. We are envious of your trip this summer. You are going to have a marvelous time! Got back from the WT yesterday. Time of my life – seriously, in the top 3 of my lifetime experiences. Thanks so much for the information and inspiration – and photos. I’m working on writing the story now but wish I was still hiking. That’s so cool! Congratulations on an amazing accomplishment, Sandra! Looking forward to reading about your experience. Please send along a link if you publish it on the web. I know what you mean about being back out on the trail. I’ve been following a great blog (BikeHikeSafari) where a guy is publishing his experience in the PCT every day. Now I’ve got a bee in my bonnet to do that epic hike. I think hiking/backpacking/trekking is seriously addictive! thanks for sharing.., this very inspiring for me, that new learn in photography. Thank you so much! We have been taking photos for years now but still feel like we have lots to learn. I bet Indonesia has lots of interesting things to photograph. Best of luck to you! Gawd these pictures make me so excited!! We are also going counter-clockwise but are planning on finishing it in seven days… ambitious maybe but I think we are in the shape to do it! I hope our pictures are half as beautiful as yours, I know the scenery will go above and beyond! You are going to have a wonderful time! Are you one of the lucky ones who got a permit this year? I had a peek at your wonderful blog, and it looks like you have a lot of hiking experience and should know what kind of pace you can manage. I am sure your photos will be great–it’s almost impossible to take a bad shot in such a beautiful place! We did get permits! I feel very lucky indeed! We got our permit to go counter-clockwise as well and will be doing it in 12 days……so excited!! Loved seeing your pictures as a preview of what we can expect! Lucky you! I saw a few headlines that said the permit process was incredibly tough this year. Where are you starting? Hope you are ready for an incredible adventure! We’re starting at Longmire. We feel extremely lucky to have our permit because the number of requests exceeded all previous records in the first two weeks! Longmire is a great starting point. Going counter-clockwise, your first couple of days aren’t the most exciting, but you will have a very strong finish on the west side. Please let us know how it all goes for you! We’ve been wanting to do this hike for a few years now. These were the most interesting and helpful trail notes we have found. And the photos are absolutely stunning. Thank you so much! The Wonderland Trail is absolutely amazing, so I hope you get a chance to do it soon. The permit process opens in March, so you have some time to get your plan together. Please let us know if you have any questions about the WT. We will do our best to answer them! Thank you. Many of our questions were answered by your thorough post. Thanks! The Wonderland still remains one of our very favorite hikes, so you should have a great time. We hiked the Cedro Alpamayo Trek in the Cordillera Blanca last summer. We should have posts coming about it in the next few weeks, so be sure to check back soon. Let us know if you have any questions about the Wonderland! Wow! What a great posting of a truly iconic hike. Thanks so much for this. The Wonderland Trail is my favorite hike! It’s gorgeous, isn’t it? Have done it twice and was in awe both times. Have been back to sections of it many times over the years. So, one question – you carried a tripod. Wow. I’m impressed. What brand did you pack along? I carry a Nikon D70 and am beginning to realize a tripod may be worth the weight to get to the next level with my photographs. I’m hesitant because of the weight, so am curious what you use with your heavy camera. And, one comment – I found Doug Lorain’s book One Best Hike: Mt. Rainier’s Wonderland Trail to be much better guide than Tami’s book. Tami’s book is a great book but Doug’s is much more practical, and even light enough to carry along, especially if you tear out the prep sections. The Wonderland Trail is one of our favorite hikes ever, and we hope to do it again someday, too. Carrying a tripod on a backpacking trip is definitely a commitment, but there’s no doubt that it is great for HDR, waterfall shots, selfies, low light and night time photos. We are in the process of planning our next backpacking adventure on California’s John Muir Trail and debating whether or not we can afford to carry a tripod. Do we want the extra weight? Will we have the time and energy to use it? We carried a carbon fiber Gitzo GT1540T (an old Series-1 Traveler) with a small ballhead from Really Right Stuff. The whole assembly weighs 2.2 pounds. We still haven’t made a decision about the tripod for this year, and we are considering taking a Gorillapod instead. Do you have any experience with those? Thank you so much for a wonderful blog post. This has really whetted our appetite here in the UK. Hope we get permit lucky in 2017! Thanks for stopping by and checking us out, Sarah! The Wonderland Trail is one of our favorite trails ever. In fact, we liked it so much that we headed back for more backpacking this summer! It will be interesting to see how the park changes the permit process next summer after the walk-up only chaos of this summer. We will try to update our post with the changes, but be sure to check the NPS website to have the most current, official information. Good luck to you! You guys are so inspiring :-). I really get so many good trip ideas from this site! Thank you again for all the useful information and wonderful photos! Thank you, Christine! We love knowing that you find our posts useful and inspirational. The Wonderland Trail is still one of our very favorite backpacking trips, so we hope that you get a chance to do it. Be sure to check out what the permit process is like now if you are planning on doing this trail. It has definitely changed since we last updated this. Cheers! I’m really excited to do it… hopefully I can get a permit. Honestly I have not done a lot of long-distance backpacking trips as I usually travel solo and I can’t carry too much on my own (which is why I like hiking in Europe where you can stay in mountain huts) but this hike looks amazing. I’ll have to try to convince my brother to do it with me. Maybe next September! Thank you again for all the work you put into this site. I love your photos!!!! Thanks, Christine! We love your enthusiasm, too, and we will look forward to hearing about your experience on the WT. Keep us posted!